A fundamental part of our remit as a Registered Charity is to encourage a greater awareness of the need for the conservation of British owls and other bird of prey species amongst young people. Yet whilst we are committed to visiting schools in and around East Anglia with our message, we also are visited by the many disability & special needs groups who come to see us - we are fully wheelchair accessible and the number of such groups is increasing month-by-month, especially as we are based in a rural area with no other establishments like ours within a 50-mile radius. Tucked away in a corner of S.O.S. is our new disability play area, which has been entirely funded by corporate, charity & trust contributions towards the cost. Our colleague Maz will be familiar to many of you as the powerhouse behind our fund-raising efforts and it was her idea to think about building a disabled access playground at S.O.S. to cater for children & young adults with physical or mental disabilities, recognising the need for them to be able to play alongside their siblings and friends when taking a break from the birds. Up until now we have had no such suitable facilities. All aboard! The purpose-built slide, roundabout and clamber castle plus the special floor surfacing were all installed with the safety needs of children with disabilities in mind. As a small charity we would not have been able to afford funding a project as large as this ourselves and therefore about 18 months ago Maz began approaching corporations, companies, trusts and foundations to see if they would assist us with donations towards this important project. This week, the dream was realised. As a result of hundreds of letters and numerous 'phone calls, the funds required to purchase the purpose built equipment slowly began to accrue and eventually reached its goal after a splendid award received from players of People's Postcode Lottery. As a result, last week saw the installation of a wonderful new play area completely funded by the generosity of these corporate sponsors. 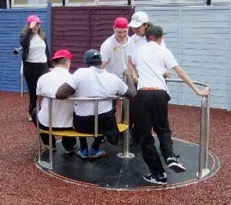 Complete with team swings, extra-wide slides, a roundabout capable of carrying a wheelchair, a see-saw and safety-enhanced clamber castle, and with the whole area surfaced with soft eco-bond safety flooring, we felt the best way to open the facility would be to ask some special guests to put it to the test. Helen Cumbers of Activities Unlimited staidly guides the hands of the two young visitors who performed the opening ceremony, whilst our esteemed fund-raiser Maz looks on, though she had her forthcoming knee-op on her mind as well! So the local branch of Activities Unlimited, who are dedicated to creating fun opportunities for children and young people with additional needs and disabilities, brought a group of youngsters along and great to say, the play area passed with flying colours! At then end of an exhausting session, we said goodbye to a tired but happy bunch of youngsters who had thoroughly enjoyed themselves. On their behalf we'd like to thank the many organisations who contributed towards the cost of the venture - from the looks on the faces of our visitors this week, you generosity will be very much appreciated by all who enjoy the new facility for many years to come.